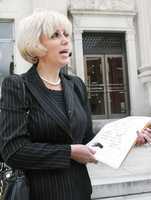 In an article in the Columbus Georgia Ledger-Enquirer newspaper, local lawyer William Mason called Orly Taitz “nuts”. That reminds me of what attorney and CNN legal affairs consultant Jeffrey Toobin said about an earlier round of birther lawsuits, way back in 2008: “whack-job”, “total bull”. The Ledger-Enquirer has had some great coverage of the Rhodes v MacDonald lawsuit in their home town.